FIFTH GLASS BOTTLES are the most popular and economical syrup dispensers. Approximately ten to twelve dollars of retail sales is possible from one fifth bottle of syrup. Several fifth bottles are required for the bestselling syrups. Cap included is size 28 mm/400. Quart plastic long neck dispensers are also available. POURERS are pushed into the top of the fifth glass bottles. The pourers are vented so as to pour a steady stream of syrup. The pourers will also fit the top opening of the plastic quarts. Colors available are dark sparkle red, dark sparkle green, fluorescent red, green, blue and yellow. SPEED POURERS have a larger opening to pour thicker syrups. Colors available are dark sparkle red and fluorescent red. HARD POURERS hard extension is used to poke holes for the syrup to penetrate the ice. Colors available are red and blue. 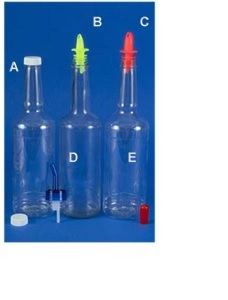 NIGHTCAPS fit on pourers and speed pourers to keep ants and fruit flies out of the fifth glass bottles overnight. FLAVOR LABELS are mylar pressure sensitive. The label has a clear plastic coating that provides a glossy, waterproof stain resistant finish. Mylar labels are used for fifth glass bottles, plastic jugs, dispensers and flavor menus. Labels are available for the entire flavor list plus labels listed below. A blank label with only the red border is also available. Red Ink on White Actual Size 3/4" x 3"
1 ½ GALLON ROUND SYRUP DISPENSER delivers syrup direct to the snow ball. The variable flow of the spigot is faster than the fifth glass bottles with pourers. Flavored syrup is usually prepared by the gallon and will easily fit into the 1 ½ gallon dispenser when depleted to less than one-half gallon. Pouring one gallon into the syrup dispenser replaces the need to fill five fifth glass bottles. The container is 7 ¾" tall and 10 ¼" at the widest point - handle to handle. The standard spigot has a lock open position. Self-closing non-locking spigot handles is an option. 2 GALLON ROUND SYRUP DISPENSER is 10 ½" tall and 10 ¼" at the widest point - handle to handle. 5 GALLON ROUND SYRUP DISPENSER is 13 ½" tall and 13 ¾" at the widest point - handle to handle. This dispenser is sometimes used to fill fifth glass bottles with simple syrup. 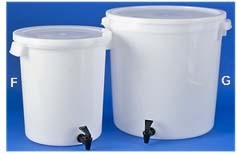 10 GALLON MIXING TANK is 15 ¾" tall and 17 ¼" at the widest point handle to handle. Mixing tanks are used mostly to prepare larger quantities of simple syrup. 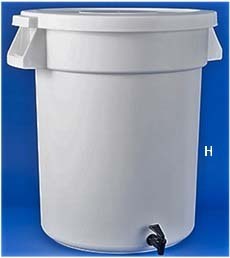 20 GALLON MIXING TANK is 23" tall and 23" at the widest point - handle to handle. LARGER MIXING TANKS - Call us for size, price and availability. MIXING PADDLE is 40" long with a 4 ½" by 7' paddle. Plastic or Stainless. SPIGOT requires a ¾" hole. This standard spigot has a lock open position and is the replacement spigot for dispensers and mixing tanks. Multiple lock open spigots in the same tank will produce a bottling machine. OPTIONAL SELF CLOSING HANDLE is available for the standard spigot. Some retailer outlets and special event concessions allow their customers to flavor their snow balls. The self-closing handle prevents someone from accidentally draining the tank. PUMP dispenses one ounce servings of flavor concentrate to prepare snowball syrup. The pump fits one gallon plastic jugs with a 38mm/400 size cap.